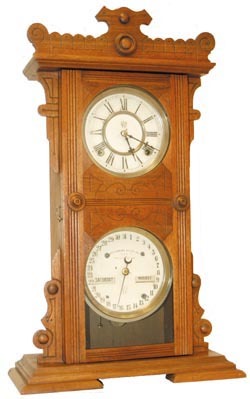 Waterbury Clock Co. "Calendar No. 44", C. 1891. 24" walnut case is near perfect, probably refinished many years ago. Other than 8 applied button ornaments the other designs and decorations are etched in the wood. Dial rings and gong base are nickel, the bob brass. The 8 day half hour striking movement is running very strong, hands are all correct, two old glasses. The three labels on the back identify the clock, one is about 85% there, one 25% and the third about 70%. Ly-Waterbury #284.